GIST is defined as becoming “resistant” when it no longer responds to the drug(s) that are used to treat it. Most of these drugs belong to the class of tyrosine kinase inhibitors (TKI’s.). These drugs bind to KIT and PDGFRα kinase receptors to silence the abnormal tumor growth signals. However, an alteration in the structure of KIT and PDGFRα, caused by a few specific DNA changes, may disrupt the binding of a given drug to the receptors. Consequently, the ability of the drug to bind correctly to the target receptor is compromised, not able to silence the signal and resistance or tumor growth occurs. About 15% to 20% of GISTs have primary resistance; they don’t respond to these drugs, right from the start of treatment. The TKI’s approved for GIST include; Gleevec (1st line), Sutent (2nd line), and Stivarga (3rd line). Primary Resistance Patient never responded to treatment at all. It is “intrinsic”, meaning failing imatinib within the first six months of treatment. Primary resistance occurs in about 10-15% of GIST patients. Mutation type such as D842V mutations which do not respond to imatinib (or sunitib) and together with wildtype GIST accounts for majority of cases of primary resistance. Note that Exon 9 mutations are a special case, as this mutation responds better to higher doses (800mg) of imatinib. Patients started at 400 mg will often have progression within a few months and this looks like primary resistance. Secondary Resistance Occurs when a patient initially responds to the medication, but then stops responding after six or more months of successful treatment. 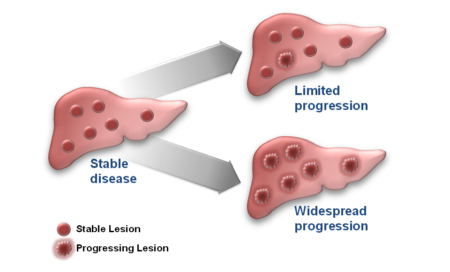 There are generally two types of secondary resistance: Localized/Limited Progression – progression in one or two lesions Generalized/Widespread Progression – progression of more than two lesions (often many, most or all). The difference in how these two are treated. See “What are my options?” below There are a number of different causes of secondary resistance, but the biggest cause seems to be the acquisition of additional (secondary) mutations. I have Resistant GIST. So, now what? First, make sure you really have progression. False progression: Sometimes when tumors respond to medication, they can sometimes swell and appear larger on a CT scan. These tumors will usually have a change in density (less dense) and appear darker on a CT scan and the border may become better defined. A PET scan of this type of tumor will typically show decreased glucose uptake. In addition, tumors that have a density very similar to surrounding organs (like the liver) may be hard to find on an initial scan. Following drug treatment, they become less dense and can then be seen later on CT scans. This may appear to be progression since they can now be seen for the first time, but in fact they’ve been there all along, and are now visible since they are responding to treatment. False progression, if it occurs, usually happens early in the treatment and is probably much more likely in 1st line treatment (typically imatinib) than in later treatment lines. Second, consider consulting with a GIST expert. The above examples of how difficult it is to determine whether progression has occurred help demonstrate the need for a radiologist familiar with those types of responses. As a case that has progressed can be considered advanced, it is best to also involve a multidisciplinary team with expertise in GIST. Generally speaking, GIST experts can be found at larger cancer centers that have a Sarcoma Center. To find a GIST specialists, please go to our searchable database of GIST Specialists. Treatment options generally depend on the type of progression you have, as limited and widespread progression are handled differently. Please note that this is generalized information, and you should speak with your physician who may be more familiar with the specifics of your case. If it is possible to do surgery, this may be a good option. If on imatinib, continue with the same dose or increase the dose if well tolerated or consider switching to a different kinase inhibitor such as sunitinib (as 2nd line) and then regorafenib (as 3rd line). Consider other therapies, such as radiofrequency ablation (RFA), embolization, or chemoembolization. For bone metastases, palliative radiation therapy may be beneficial. Go to an increased dose of imatinib if tolerated or consider switching to a different kinase inhibitor such as sunitinib (as 2nd line) and then regorafenib (as 3rd line). Patients resistant to the three approved drug therapies need to strongly consider a clinical trial, or if not eligible for a clinical trial consider off-label options (drugs are often prescribed for uses other than what the FDA has approved). In some countries off-label treatment may not be available, and some insurance companies may not pay for your treatment. To find out about clinical trials for GIST, please see our clinical trials website. Some patients have had success with reintroduction of Gleevec or another previously tolerated and effective tyrosine kinase inhibitor. Patients not taking any TKI often progress quickly, so it’s generally recommended to stay on some type of TKI, even if progressing.